When a wave is refracted into a dielectric medium whose refractive index varies with wavelength then the angle of refraction also varies with wavelength. If the incident wave is not monochromatic, but is, instead, composed of a mixture of waves of different wavelengths, then each component wave is refracted through a different angle. This phenomenon is called dispersion. Figure 62: Refractive indices of some common materials as functions of wavelength. 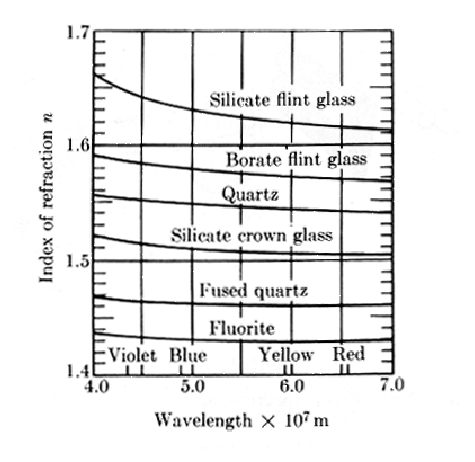 Figure 62 shows the refractive indices of some common materials as functions of wavelength in the visible range. It can be seen that the refractive index always decreases with increasing wavelength in the visible range. In other words, violet light is always refracted more strongly than red light. 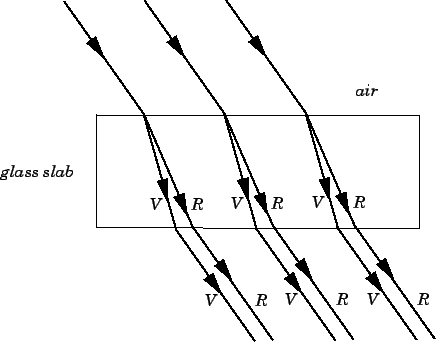 Figure 63: Dispersion of light by a parallel-sided glass slab. Suppose that a parallel-sided glass slab is placed in a beam of white light. Dispersion takes place inside the slab, but, since the rays which emerge from the slab all run parallel to one another, the dispersed colours recombine to form white light again, and no dispersion is observed except at the very edges of the beam. This is illustrated in Fig. 63. It follows that the dispersion of white light through a parallel-sided glass slab is not generally a noticeable effect. Figure 64: Dispersion of light by a glass prism. Suppose that a glass prism is placed in a beam of white light. Dispersion takes place inside the prism, and, since the emerging rays are not parallel for different colours, the dispersion is clearly noticeable, especially if the emerging rays are projected onto a screen which is placed a long way from the prism. This is illustrated in Fig. 64. It is clear that a glass prism is far more effective at separating white light into its component colours than a parallel-sided glass slab (which explains why prisms are generally employed to perform this task).